I wasn’t gonna post this at first, but, then I said, what the hey. Here it is. 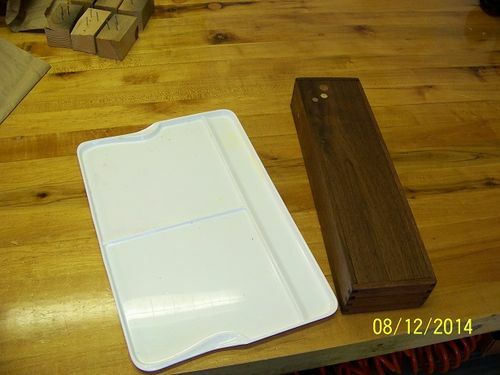 A Walnut box, about 14×3 1/2×2 1/2. The pieces are all 1/4” thick. Let me give a big Thnx to Steve Ramsey for his detailed description of how to do this (I’ll call it a friction fit lid). 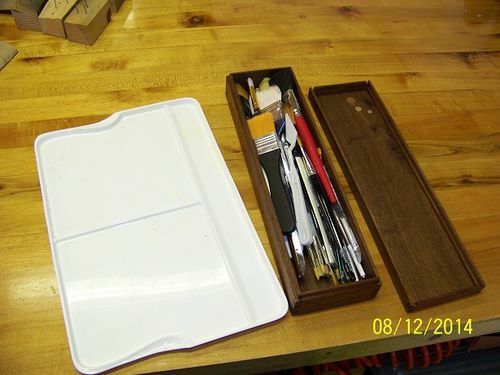 I watched his video when he built a small box with a very nice detailed “how-to” do this type of lid on any box. Here is a link to it: https://www.youtube.com/watch?v=osOXOZIVOv8 ...................Anyhoo, the wifee started painting on canvas’ here a while back and she needed a small box to keep her brushes when she traveled with her friends to get together to paint. This is it. Box joints/finger joints, and rabbits keep this together. I didn’t bother filling in the openings from the rabbited top and bottom of the box. I did add a little of what I’ll call, “box-bling”.....LOL. It’s just a few different sized and species dowel rods, (Cherry, Oak, & Beech). I kinda like the way it came out. The wood-bling goes across the top, and down the side. Sorry bout the long explanations in some (all) o my posted projects. I guess I like to ramble. OK, Anyhoo, again, this is finished with cotton wipes inside a stocking with Danish Oil. (A wipe on of 3 coats). As always, thnx for lookin in, and any and all comments, good/bad/ugly will be very appreciated. Cool box Roger. I love walnut. Cool idea using the dowels!love the walnut it looks great! Good job and a very nice tool for the wife. That will keep the BOSS happy . You know how to please !!!! Very nicely done, with beautiful craftsmanship and walnut. And, great way to keep the little lady happy and supporting your hobby. 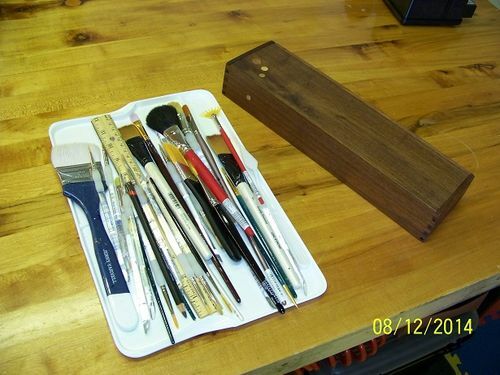 what a nice thing to do for your wife, its a very nice paint brush box, and im sure she is very happy with it…very stylish..
Too bad the first photo dosen’t do justice because of the walnut being so dark. Really beautiful Roger, and very well made too. I’ll bet the Mrs. Really loves this!! Nice Job! Thanks for posting. I will have to check out Steve’s web page to see if I can find the video you talked about. Sweet little box Roger! Love the walnut.